Alda, a yellow labrador retriever, was a Breeding Stock Dog from Guide Dogs for the Blind. Follow Alda’s breeding career while learning about season or heat, breeding, pregnancy, whelping, and care of the puppies. She had her first litter of 9 puppies in 2003 when she was two years old. 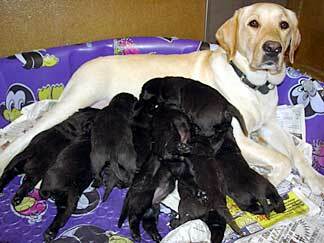 Six of those pups are active Guide Dogs. Her second litter was born in 2004. Third litter, born Jan 2006, and her forth and final litter was born on August 7, 2006.